Camels were used for millennia as the primary form of transport linking Asia to Europe through the Middle East. In the past centuries shipping and trains have superseded this traditional form of transport. If you want to get a feel for how our world was linked and the mode of transport all intercontinental commerce used until recent times, Wadi Rum is the perfect location to experience this. Wadi Rum landscapes are iconic representations of the arabian peninsula as the junction of the three old world continents, and the are provides a safe, tourist friendly opportunity to gain an understanding of the region. Additionally the area which has received UNESCO World Heritage Listing for its natural beauty is one of the most memorable and picturesque landscapes to undertake this experience. For multiday tours an additional camel is required for luggage and other equipment. 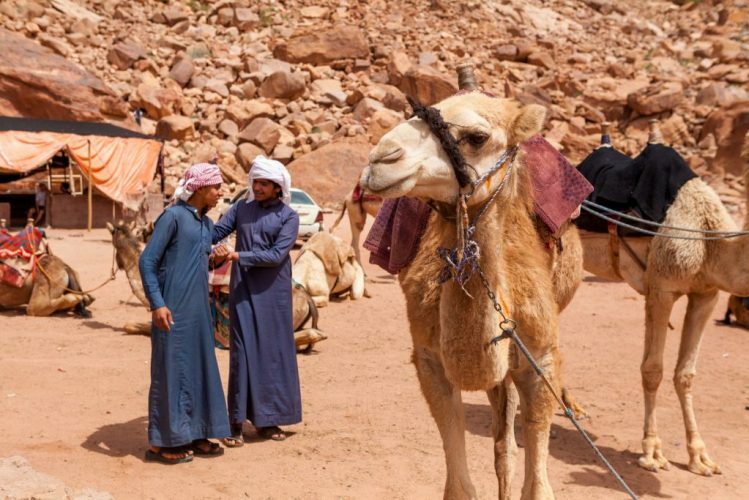 Camel transport is so significant in the imagery of trans asian trading routes, Lawrence of Arabia’s WW1 rebellion, and Nomadic lifestyle on the Arabian peninsula that it is number 3 on our list of best things to do in Wadi Rum! We offer customised short rides on camel back that allow guests to incorporate a camel ride into a limited time in Wadi Rum. This does not incorporate any sightseeing but allows guests to experience the camel riding experience and travel the approximately 10km between the camp and village. Includes: camels, saddle and riding equipment, lunch and local Bedouin camel handler and guide. We offer customised multi-day camel tours for days ranging from 2 to 5 days. These itineraries that travel through the Wadi Rum Protected Area visit major attractions along their routes and on the longer journeys stay with the still nomadic herding families living within the Protected Area. The primary objective of these experiences is to provide an opportunity for guests to travel back in time and experience the lifestyle that was prevelant in the region up until the previous century. These are amazingly unique experiences for guests to travel through the desert on camelback for several days and experience the one time commonplace transport of the Middle East and Central Asia. Each day will revolve around the preparation of the group for transport. Mornings will begin with breakfast followed by preparation and loading of the camels, the group will ride until the heat of the day will force an intermission where camels will be rested and rehydrated while the bedouin and guests will likewise rest, share tea, social and take lunch until the peak heat of the day passes. Following this the second half of the travel will continue, until dusk where camp will be prepared each night. Various locations and experiences will form the itinerary and depend on the length of the journey but these experiences are primarily intended to allow guests to gain an understanding and appreciation for the camel caravans that were integral to world trade for the past millenia.